Should I install hardboard to replace ugly vinyl siding? Can I ask for your professional opinion? We’re doing some work on our humble abode (transforming our front porch into a 4-season foyer/mudroom, adding a 1/2 bath in front closet, and adding a room on the 2nd floor above the mudroom. We’re super excited! 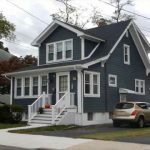 This all presents an opportunity to rethink our siding, and we’re itching at the opportunity to improve our curb appeal by scrapping the broken and ugly vinyl siding. 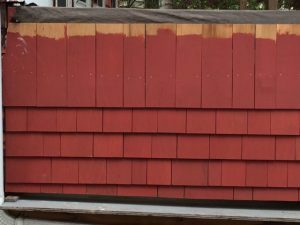 One option we’re considering (besides scraping, repairing, and repainting the ceder shingles) is Hardie Board fiber cement. In your opinion, is fiber cement board something that if done right can improve resale value over vinyl? We’re heard fresh paint on solid cedar is best, but does cement fiber stack up as decent Plan B? Hardboard siding such as HardiePlank ® is not pressboard. Pressboard falls apart if it isn’t meticulously cared for. If the coating on the outside fails, it absorbs water like a sponge. In New England, it is almost impossible to do everything right. The house my clients bought had large areas where the pressboard was deteriorating, like the white siding in the picture here. The big advantage of HardiePlank® is that you do not need to paint it as often as wood. 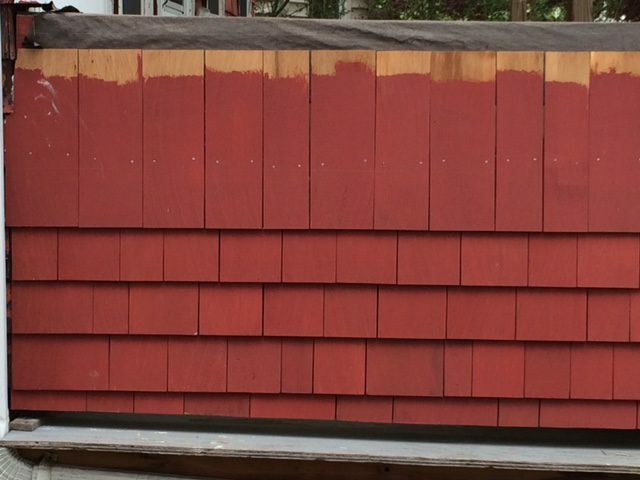 This makes it much easier to maintain, because wood shingle needs to be painted fairly regularly in New England. (Some say every three years, some say every five.) Hardboard keeps your house looking good for resale, as long as you don’t have warping or deterioration. Hardboards, like HardiePlank® have some of the same vulnerabilities as pressboard, but it is significantly more sturdy, compared to pressboard. The material underneath is fibrous and dense. It doesn’t swell the way that pressboards did. But consumer complaints continue, with accusations that the boards warp, fall apart, or the caulk fades to a different color and looks awful. This is what you’d need to do if you choose to use HardiePlank instead of cedar wood shingles. 1) Watch for any major flaws: Be on the lookout for any cracked paint, missing sealant, holes, loose nails and other such problems in your hardboard siding that could lead to moisture infiltration. Even slight discoloration can be an indication of water absorption. 2) Slope the ground away from hardboard siding: Make sure that the ground slopes away from the foundation. If this is not the case, you will have problems with rot, mold and mildew. 3) Keep nature away from hardboard siding: Hardboard siding must be installed at a distance of at least 6 inches from the ground, grass, mulch, and plants. Do not allow vines or creepers to twine around your hardboard siding. 4) Direct water drainage away from hardboard siding: Any drainage pipes and gutters must be routed away from the foundation. Also ensure that all these pathways are free of clogging and obstructions. 5) Maintain your gutters: Keep downspouts and gutters free of blockages to the flow of water. 6) Point sprinklers away from hardboard siding: If you have sprinklers in your lawn, you must direct them away from the siding. Prolonged exposure to the water can cause the siding to swell, warp, crack, lose color, and grow mold and fungus. 7) Never use power washers on hardboard siding: Never use power washers to wash your hardboard siding. The pressure of the water can be too high and can cause splits or cracks on the siding. 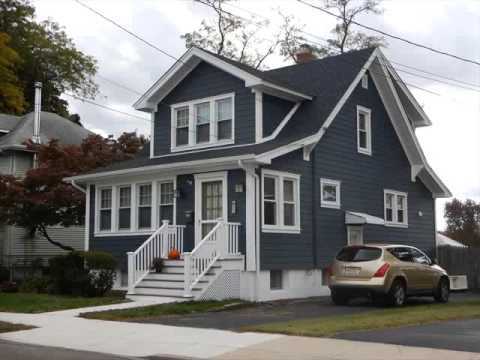 Wood shingles are very good siding for New England. Shingles are installed in overlapping rows so that there are three layers of wood between the weather and your wood frame. Even if a shingle gets damaged by a falling tree branch, there are two layers beneath for support. Wood shingles will rot if they are installed touching soil. They rot when water is continually splashed by rainwater, because the gutters and downspouts are splashing on them. They lose paint from rain, over time, but they shed water well and don’t rot for decades under normal conditions. They discolor from vines growing on them, and will rot if covered with wet plants for years. They will grow mold from staying wet. Ice dams can damage any siding. But, from a building standpoint, that is a roof issue. As for resale, well-maintained hardboard is seen by most consumers as equal to wood siding in good condition. Hardboard looks clean and attractive to today’s buyers. Either siding, if poorly maintained, detracts from resale speed and price. So, your choice is mainly about what maintenance style you have. Wood has a more tried-and-true maintenance record. It is easy to find painters who know how to handle wood properly than those who care for hardboard. You have the option to change colors, as you choose, when you paint wood. Were this my house, I would excavate the wood shingles under your vinyl siding. Repair it, repaint it. However, you will pay more, in the long run, to keep a wood shingled house looking nice.